A new report just out from Forrester confirms my long-standing view that the migration of American households to a digital life is accelerating, the leading side-effect of the Law of Disruption. A summary of the report in The New York Times on Sept. 2, 2009 notes that the speed with which consumers are adopting disruptive technologies is increasing. Where earlier disruptive technologies such as railroads and telephones took decades to achieve mainstream status, digital technologies follow a much shorter cycle--getting shorter still all the time. According to Charles S. Golvin, co-author of the report, "The digitization of our daily lives has been steadily ramping up over the past decade." For example, HDTV will reach 70% penetration within five years. Sixty-three percent already have broadband access. 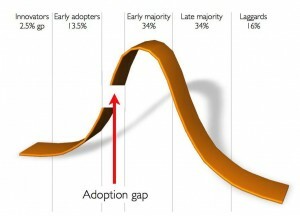 Most technology followers are familiar with the technology adoption curve shown below. The curve suggests that the majority of consumers wait until innovators and early adopters have already embraced new technologies, working out the bugs and building up enough base to drive prices down. In Geoffrey Moore's famous adaptation of the curve, technology marketing requires an early focus on the gadget geeks, but requires a critical shift to the later-stage adopters at just the right moment, or what Moore referred to as "the chasm." The Forrester report does not challenge the shape of the curve, only the timeframe with which digital technologies move through it. As I argue in "The Laws of Disruption," the increase in speed causes increased conflict with social, economic and legal systems that adapt much more slowly to change than do today's consumers. As a simple but representative example, consider a story from CNET's Stephen Shankland on the same day. Photo hosting service Flickr announced a change in its policy for handling claims of copyright infringement, based on outrage over the removal of parody images of President Obama photoshopped to look like the Joker from "Batman: The Dark Knight." Where the company used to simply remove an image whenever it received a notification that it violated copyright, the company announced it will now temporarily replace the image but allow comments about it to remain in place pending investigation. According to CNET, none of the likely owners of relevant copyrights (the original photo, DC comics, etc.) had complained about the Obama photo. But under the 1998 Digital Millennium Copyright Act, Internet hosts that do not respond to notices (even those that may be overbroad or outright fakes) risk losing their immunity for what can be very expensive damages. As digital images can flow freely and any home computer user can make modifications to them, keeping up with copyright's outdated sense of "ownership" becomes a razor's edge for companies like Flickr. Previous article:The Incredible Information Valuation!